The 4-channel vibration data logger PCE-VM 5000 is especially designed for precise measurements. Despite the fact that the 4-channel vibration data logger is a complex and sensitive device, its hard-wearing design enables an operation for many years. 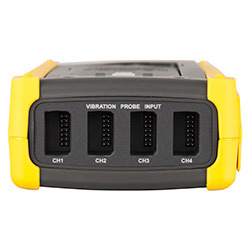 The 4-channel vibration data logger PCE-VM 500 indicates at a large, lightened LCD display four channels of simultaneous vibration measurement due to remote vibration sensors. The 4-channel vibration data logger measures in a frequency range of 10 Hz to 1 KHz the velocity, acceleration and displacement. The captured data values are saved on a SD memory card where you can chose between automatic and manual data storage. By means of the SD memory card the data can be transferred afterwards to a computer in order to analyze them in an excel-file. 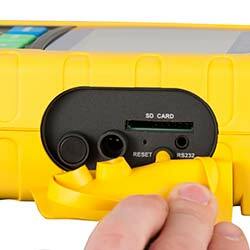 By means of the 4-channel vibration data logger PCE-VM 5000 you can chose between different measurement units. For acceleration the unit m/s², g and ft/s², for velocity mm/s, cm/s and inches/s and for the displacement mm and inches can be indicated. 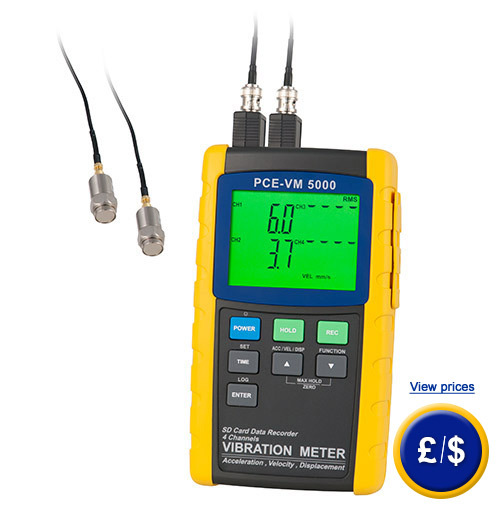 If there are any questions about this vibration data logger PCE-VM 5000, please have a look at the technical specification below or call: UK customers +44(0) 23 809 870 30 / US customers +1-410-387-7703. Our technicians and engineers will gladly advise you in all vibration meters and all products in the field of measuring instruments, regulation and control and scales.